I find myself lately really enjoying double coneflowers (echinacea). Often in gardening we must make choices, do we want big, complex, showy blossoms, or do we want blossoms for a long period of time. Stella de Oro daylily blooms for a long time with relatively small plain yellow blooms, but there are other daylilies with amazingly large and complex blooms, that bloom for a fraction of the time. Irises make big showy blooms, some of my favorite, with multiple colors, but for maybe a week each Spring. Coneflowers, to me, were always in the plain camp. They bloom for such a long period of time, but with wide spaced petals, and their most prominent feature being a big brown cone center, I’ll pass. 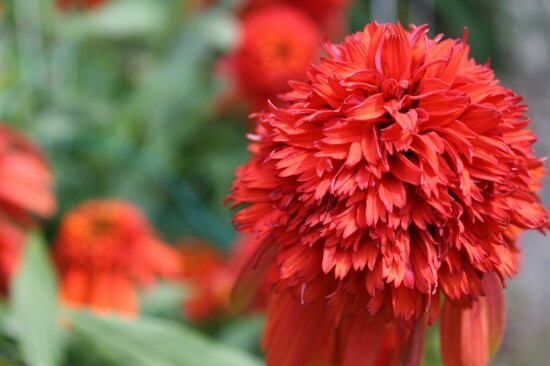 But lately double coneflowers have been developed, the first one, to my knowledge was not developed that long ago, I first saw them in gardening catalogs in 2005 maybe, in pink, but since then the pallets have expanded. 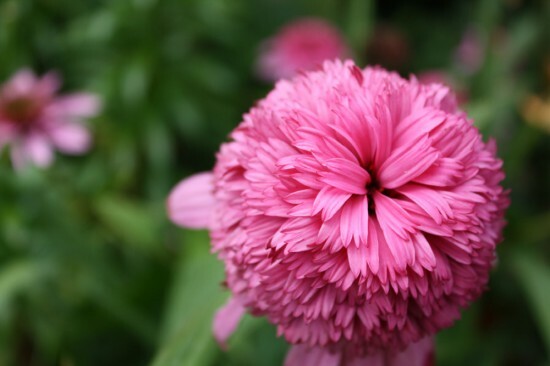 These flowers are a great option for your full sun ornamental garden, they have big, beautiful showy blooms, and bloom for a very long time. They slowly multiply in the garden as well, filling the spot in which you plant them, and as perennials should come back year after year. I think they could make a statement in a mass planting of a single color, I especially like the red ones. I also think they’d look great in a mixed planting of all different colors, well, the colors they come in. Red, pink, yellow, and even white so far that I know of. The white ones might work very well for a wedding. They aren’t without issues though, anytime you get a double blossom on a flower you tend to have problems with the stems being sturdy enough to support the weight. The plant breeders selected for flower size, but not necessarily stem strength, so they can often need support, not always, sometimes mine do okay without support. But, I guess I should have said “issue” not “issues” as that is really the only thing I can think of. Animals don’t seem to bug them, stupid critters eat some of my other plants but never these. They’d work well in a cutting garden too if that is your thing. They’re even drought tolerant, and while Michigan and been more or less flooded with rainfall this year (I haven’t had to water the garden once except for containers), I hear out west it is pretty dry. They look like a great addition to the garden. Are they full-sun plants ? Love these. I think the Razzmatazz would look so stunning in my garden. Thank you for sharing. Fabulous flowers! I love the Double Coneflower in red and pink colour. They will look more beautiful in my lovely garden with decorative planters. I will grow red double coneflower in my white cube planter. Thank you for the great information regarding double coneflowers!